Saul David’s 100 DAYS TO VICTORY is a totally original, utterly engaging account of the Great War – the first book to tell the story of the ‘war to end all wars’ through the events of one hundred key days between 1914 and 1918. Ranging from the young Adolf Hitler’s reaction to the assassination of Archduke Franz Ferdinand, through a Zeppelin raid on Scarborough, the tragic dramas of Gallipoli and the battlefields of the Western Front to the individual bravery of the first Indian VC, Saul David brings people and events dramatically to life. Throughout his gripping narrative we hear the voices of men and women both eminent and ordinary, some who were spectators on the Home Front, others - including Saul David's own family - who were embroiled in epic battles that changed the world forever. 100 DAYS TO VICTORY is the work of a great historian and supreme story teller. Most importantly, it is also an enthralling tribute to a generation whose sacrifice should never be forgotten. If you're an ordinary person and you want to read one modern book on the First World War, this might well be it. Saul David has divided the war into 100 crucial days - and given us 100 well-told stories...recounted here with great skill. Following the previous examples of Antony Beevor are absorbing accounts... absorbing, because of, not despite, the harrowing detail. 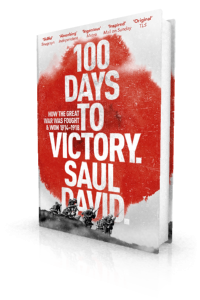 100 Days to Victory by Saul David takes an episodic approach to the whole conflict, combining a skilful military and political overview with personal recollections of the author's family and vignettes from the lives of the ordinary people of Europe. Saul David's '100 Days to Victory' is military history for people who think they're not interested in the Great War. David's snapshot approach - describing the events of 100 significant days in the First World War - brings a brilliantly personal perspective (his own great-uncles fought and perished in the war) to a subject that too often vanishes under a welter of mud and blood. The publishing rush for books on the First World War began in earnest this year. The best I read was '100 Days to Victory' by Saul David. David has fused a controlled, authoritative political and military history of the war with a series of affecting pen-portraits of those people - including his own family - who were thrown into chaos by the fighting. If you think military history tends to the turgid, try Saul David’s 100 Days to Victory...which gives vivid accounts of 100 “momentous” events which took place between 1914-18. It’s a most effective device with which to convey both the global scale of the conflict and the fact that it was much more than a list of bloody battles. David...is most at home in the colonial wars of the 19th century, but he occupies this unfamiliar territory with practised ease... [He] peoples his narrative with a colourful cast of characters, from the much-maligned generals at the top to the Tommies in the trenches and the women working back in Blighty, and he guides his readers home with a sure and easy hand. He has pitched this exactly right. All the really important dates are here, as well as some inspired choices... Scholars of the war will welcome Saul David's succinct summaries of the various academic controversies around some of these subjects, while those daunted by the sheer scale of the conflict will be glad of the opportunity to digest it in bite-sized chunks. If any book will inspire readers to investigate further, this one will - which, given the number of WWI histories about to come our way, can only be a good thing. Original and effective...His account of the First Day of the Battle of the Somme is a classic example of his skill as a narrator and historian...He exceeds the reader's expectations... Gives one of the best measured accounts of the diplomatic manoeuvrings and hesitations leading up the outbreak of war... There may be a surfeit of books about these events... Saul David's is one that should not be overlooked. Splendidly well-written... fluent, engaging, well-paced and, despite the grim subject, often entertaining. Saul David has come up with an ingenious approach. He tells the whole story of the conflict - from the shots that killed Archduke Franz Ferdinand and his wife, Sophie, in Sarajevo on June 28, 1914, to the final battlefield casualty - in a series of snapshots of 100 key moments, one for each year since the declaration of the "war to end all wars". The charm of this unorthodox technique becomes clear as soon as you open the book... A remarkable book. A splendid read... offers 100 snapshots of individual days during the war... A fine writer, David has intelligently boiled down recent scholarship on the war... Some of the best material involves David's own relatives. Excellent, original take on the war in which the acclaimed military historian offers us vivid accounts of 100 "momentous" dates and events between 1914-18. It's a great device, by which he brilliantly conveys the global scale of the conflict, and emphasises the fact that it was much more than a list of bloody battles. He also reflects on the contribution of members of his own and many other families. If you usually find military history rather turgid, then you must read this.